Welcome to charter this huge sized yacht to Catalina island, enjoy the island on a top of the line yacht. 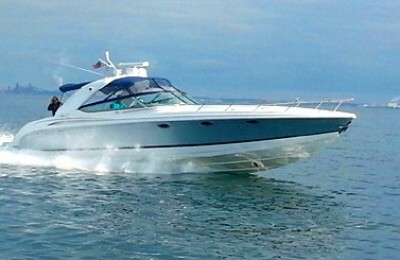 The Sea Ray 630 super sport express cruiser is top of the line of all Sea Ray brand models, combined with top notch performance, luxury and comfort. 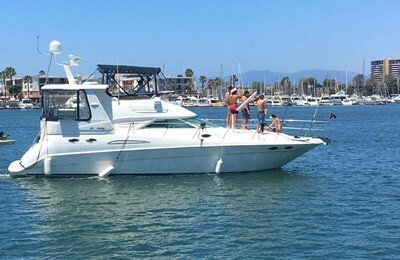 Take your family or best friends aboard this twin turbo charged V12 engine express cruiser, the cockpit space and salon area are extremely spacious, just lay down yourself in the cockpit sun pad, enjoy a smooth and exciting cruise. Stepping up to the front deck, there is a huge space for your enjoyment. 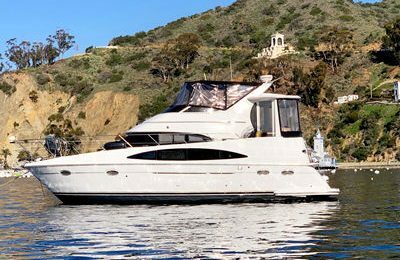 The journey to Catalina island is perfect on this powerful and stylish yacht, only 2 hours cruising time from Marina del Rey to Avalon, or 1.5 hours to 2 harbor. Sea lions, Seals, dolphins, Sea birds are very often been spotted year around. Whales are seasonal, often been seen during Jan to Mar. Just enjoy the ocean and sea breeze with California sunshine, have a picnic or wine tasting over the water. Onboat Safety boating Announcement: In order to maintain our top safety standard, All Onboat boats are fully equipped with safety gear according to federal regulations, all captains in service are furnished with valid Coast Guard captain license.